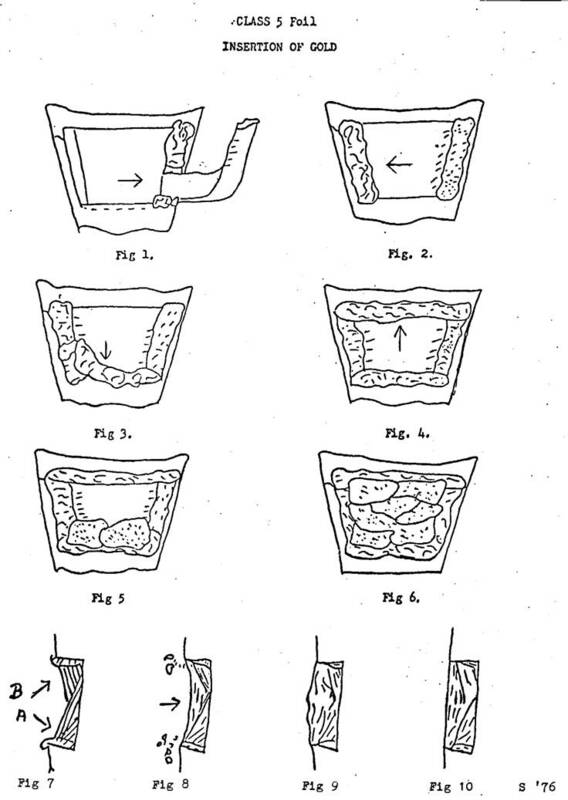 Class V cavity prepared in lower first bucuspid, buccal surface, for the reception of gold foil as the restorative material. c. Parallel with occlusal plane of the teeth. d. Sufficiently long so that the mesio-occlusal and disto-­occlusal line angles are covered by the gingival tissue. a. Placed beneath the level of the gingival tissue. b. Parallel with occlusal outline. a. Straight, connecting occlusal and gingival outlines. b. Parallel to the respective general contour of the tooth. c. Include a portion of the mesiobuccal and disto-buccal line angles of the tooth sufficiently to be covered by the gingival tissue when restoration is completed. 4. This presents the typical Class V outline form for a gold foil restoration. There are numerous atypical outline forms for which the typical outline serves as a basis. This cavity form was refined from the Black type of cavity by W.I. Ferrier. a. Must be smooth and at uniform depth. b. Established just within the dentin. Should parallel the surface contour of the tooth rather than the long axis, occluso-gingivally (Fig. 23). c. Usually flat. 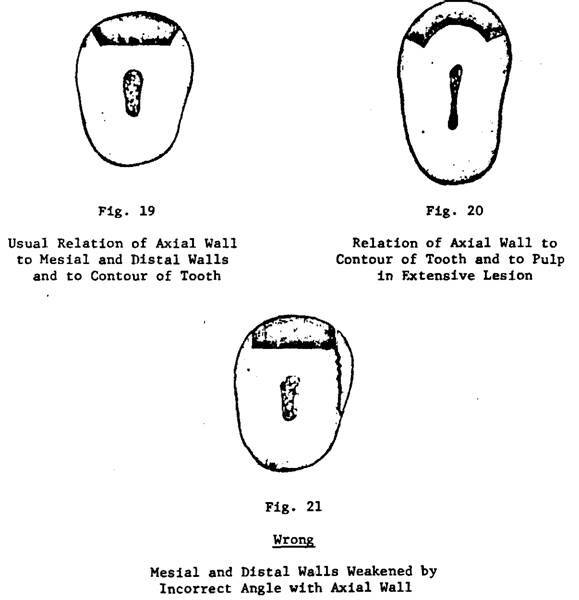 If the tooth is highly contoured, or if the cavity is extensive mesio-distally, the axial wall follows the contour of the tooth surface, mesio-distally (Fig. 20). b. Form an obtuse angle with the axial wall and thus slope outward from the axial wall. c. They are definitely never undercut or even at right angles to the axial wall (Fig. 21). d. Meet occlusal and gingival walls in sharp definite line angles. b. Meets the axial wall at a definite acute angle (Fig. 23). 5. Retention, therefore, is gained principally by the convergence of the gingival and occlusal walls, and to a lesser degree by the box effect of the slightly divergent proximal walls. Excessive retentive features are not essential, for this restoration is not subjected to external forces. 6. The internal portion of the preparation is finished with definite straight line angles and with sharp point angles. Great care must be observed to avoid the overoperating of these line angles and the attendant dangerous consequences (Fig. 24). Convenience form is not a factor for this class of foil cavity, for it is readily accessible to instrumentation. Clinically, access is achieved by retracting the gingival tissue by suitable means so as to present a proper field and to have the area readily available for instrumentation. 1. Enamel walls are planed smooth and straight with a freshly sharpened cutting instrument. 2. 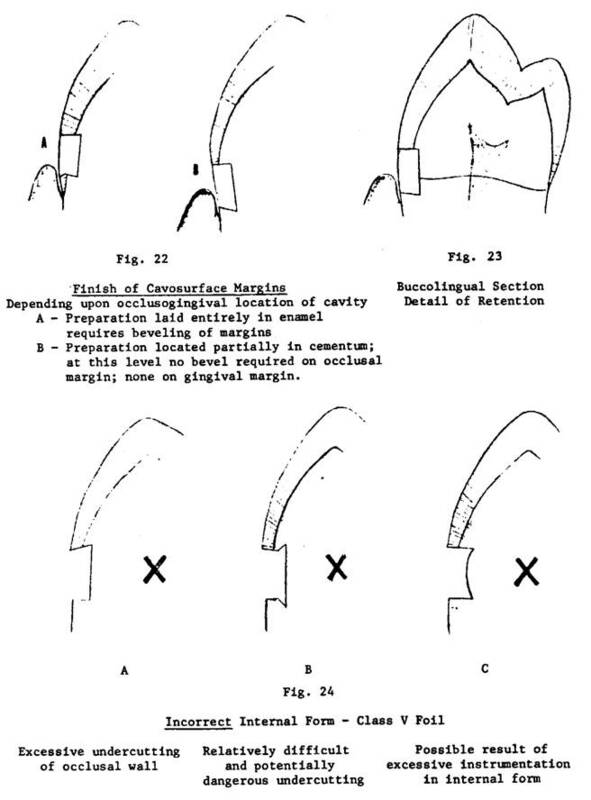 The location of the walls and the condition of the enamel determines whether or not any or all of the cavosurface margins should be beveled and to what extent (Fig. 22). 3. All walls are finished so that the margins are straight and true and devoid of any fragile or loose rods. a. If established in enamel, - the cavosurface margin will be slightly beveled in keeping with the plane of the enamel rods in that area. In this instance, the cavosurface bevel will be parallel with the plane of the enamel rods (Fig. 22-A). b. If in the cementum of the tooth, - a truing and planning of the margin will automatically establish the required cavosurface angle (Fig. 22-B). establish incisal wall - with side of bur (with end directed toward proximal surface). proximal and incisal walls, line angles and point angles. 4. Angle formers may be used, with caution, to sharpen internal line and point angles. 5. Wedelstaedt chisel, reverse bevel to plane and true enamel walls. 6. Wedelstaedt chisel, regular bevel to plane axial wall. 7. G-3 explorer to test and clean line and point angles. 1. 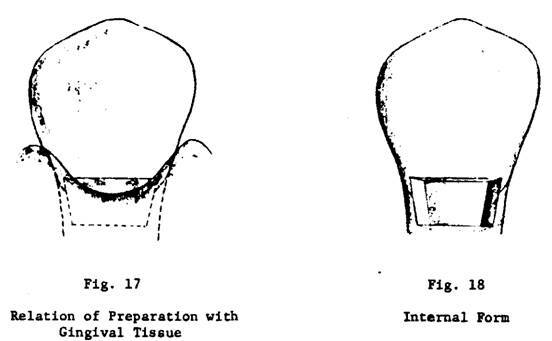 Line one proximal wall with noncohesive foil (Fig. 1) using foil pliers and parallelogram condenser. Select a pellet of such size that it is somewhat longer than the length of the wall and slightly wider than the depth of the wall. Form it into an elongated cube, between thumb and finger and the beaks of the pliers. Carry foil to place on one proximal wall with pliers; stabilize with one parallelogram condenser. Exchange pliers for second parallelogram; flatten foil to wall (don't overwork it). 3. Stabilize noncohesive foil and begin insertion of cohesive foil (Fig. 5). And with the parallelogram condensers place 2 or 3 annealed pellets in floor of preparation, using a size such that the 2 or 3 will cover the axial wall and contact the noncohesive foil. Stabilize noncohesive with one parallelogram; hand condense cohesive with other parallelogram. 4. Build up cohesive foil, gingival portion (Fig. 6) with the 5.5 condenser. The line of force is into axio-gingival angle. (Fig. 7-A) Build up some bulk of foil in gingival half of cavity. 5. Lock into incisal with 5.5 condenser. Change line of force from gingival to incisal direction; stabilize gingival portion with parallelogram. (Fig. 7-B) Some force is directed toward proximal walls. 6. Build up cohesive foil with 5.5 straight condenser and 5.0 monangle. Compact the foil against surrounding walls, keeping central portion under-contoured (saucer effect). Ensure sound compaction of cohesive foil into angles (especially proximo-occlusal angles) with smaller condenser (5.0 or 4.0 monangle). Step condenser in orderly fashion in rows, back and forth from central area toward margins. 7. Pinch off noncohesive foil (Fig. 8). As margins are approached, scuff off excessive noncohesive foil, especially in angles formed by surrounding walls. Make final marginal coverage with cohesive foil. Scuff off excess of each pellet so cavosurface margin is not lost to view. 8. Complete contour using the same condenser. Force is perpendicular to axial wall (Fig. 8), and build to slight overcontour (Fig. 9). Check complete marginal coverage with G-3 explorer. 9. After condensing. Confirm compaction with foot condenser. Snap-on rubber cup in mandrel, h.p. 1. Verify compaction by burnishing surface with straight burnisher. 2. Reduce excess foil using push-cut files on proximal and gingival margins and central portion. Use pull-cut file on incisal portion. Good finger rests essential to avoid bruising tissues under dam, with files etc. 3. Establish correct contour. Alternate between files and discs and gold knife. Using discs, progress from coarsest to finest; lubricate foil and rubber dam lightly with vaseline. Run disc at slowest speed; keep it moving to avoid losing contour. 5. Exercise extreme care against scarifying cementum. 6. Polish. Keep tooth cool with air blasts continuously. Lap emery, dry, on rubber cup, slow speed; light intermittent contact. 309W - dry, on rubber cup, high speed, very light contact. 7. Clean field. Remove debris with right angled explorer and light blasts of air. Transilluminate after dam and retractor removed. 8. Irrigate and massage soft tissues.